New Zealand’s formidability as a bowling unit at home came to the fore again, helping them push past Bangladesh by eight wickets in the first ODI at Napier’s McLean Park. Led by Trent Boult’s 3/40, New Zealand’s pace attack shared seven wickets between them as Bangladesh folded for 232 after electing to bat on Wednesday, 13 February. That their pursuit lasted 48.5 overs was largely down to Mohammad Mithun, who with a 90-ball 62 rescued them from 94/6, and combined with the No. 9 Mohammad Saifuddin for an 84-run stand. A century stand between Martin Guptill and Henry Nicholls, the New Zealand openers, then put the game beyond Bangladesh early in the chase. Guptill went on to leave behind a lean patch of 62 runs in six matches to crack his 15th one-day hundred. New Zealand win the first ODI by eight wickets! In conditions that demanded diligence, Bangladesh’s batsmen paid for their intrepid approach, which led to the downfall of five of their top six inside the first half of the innings. Tamim Iqbal, the centurion from the BPL final, was first to go, when Boult swung him out with his second ball of the match. Matt Henry then got one to nip into the right-handed Liton Das, going past his defences and clattering the stumps. 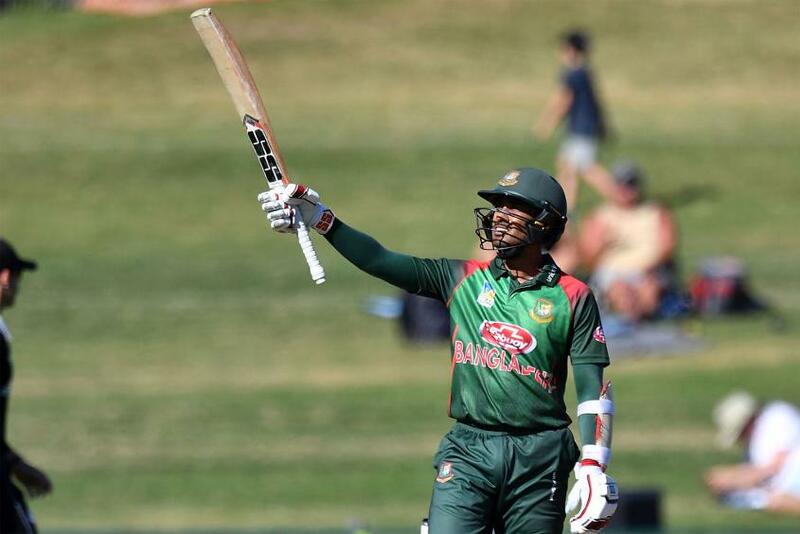 Soumya Sarkar tantalised with a boundary-heavy 30 off 22 balls, but it was too brief to effectively neutralise the early setback. When he fell, bounced out by Henry, who forced a hook out of a short ball and settled under the resultant top edge, Bangladesh had been reduced to 42/4. But Mithun showed the restraint the surfaced demanded out of the batsmen, calmly pacing his innings. He relied minimally on the big hits – his 62 contained just five boundaries – and tried to take the game as deep as he could. Unfortunately for Bangladesh, the rest of the middle order couldn’t show the same willingness to hang in there and grit it out. The first real support arrived in the form of Mehidy Hasan, the off-spinning all-rounder, who dominated a seventh-wicket stand of 37 with Mithun. Hasan used his feet to great effect, especially to the left-arm spin of Mitchell Santner, neatly tucking the ball into the gaps, before a misjudgement in length produced a top-edge that sailed easily into the hands of short fine leg. Thereafter, Saifuddin and Mithun buckled down, keeping the New Zealand bowlers at bay for 16 overs. Bangladesh crossed important landmarks during both stands – the first taking them past 100 and the second pulling them over the 200 mark. Mithun eventually became the ninth man to be dismissed, beaten by the sharp, incoming pace of Lockie Ferguson and losing his stumps. Boult then castled Mustafizur Rahman with a searing yorker to wrap up the innings. Faced with a straightforward chase, New Zealand hardly broke a sweat. By the time Miraz broke through for Bangladesh, getting Nicholls to drag onto the stumps for 53, New Zealand were well on their way. Williamson’s patchy white-ball form continued when Bangladesh successfully reviewed an lbw appeal against the New Zealand captain, as he was done in by a Mahmudullah off-break that refused to bounce. But Guptill kept New Zealand par for the course, unfurling a series of big hits. With the solidity provided by Ross Taylor at the other end, New Zealand raced towards victory, punching 56 runs in their last 49 balls. Guptill ended up with eight fours and four sixes, the last of which, off Mashrafe Mortaza, levelled the scores, before a single in the next delivery gave the home team victory with 33 balls to spare.